We are known to others by our face and not by our hands or our feet. This gives us our identity and the identity to others. Without which we would all be unidentifiable, if we all looked exactly the same. This is the beauty of nature. It has created each of us to be unique in our own ways. We also do not have a choice to pick from a menu on how we want to look like or how we wish to be born as. We got one shot at it and we had been given the looks that we have now. When we look at ourselves in the mirror each morning, we are in fact looking at a master creator. We are capable of doing the impossible, each of us having our own unique sets of skills and talents. But the question is are we using those skill sets? Our facial features is one of them. Are we using them to achieve what we want? Are we able to mesmerize people and have our way in anything we do? Can we accomplish something by capitalizing it? The muscles of our face dictate our facial expression and brings out the various intricate expressions that are displayed under various situations or circumstances. Our face is also highly vascularized and highly innervated too. So when you get a facial injury such as cuts while shaving for example, they heal really fast. Our face also comes in with many added features such as facial hair, balding patterns, various colors, texture and different measurements. The perimeter of our face extends from our hair line to the chin, at least in theory. This may not be relevant in people with certain balding patterns. Some of us have small narrow faces, some have long faces, some have round, and some others may have short and stout faces. Our head also varies in size and shape starting from size small to large. Our teeth also follows the same pattern as the shape of our face and size also varies based on symmetrical patterns. Ultimately it comes down to the imaginary lines and points. This is a system in itself. Our face is also an architectural marvel designed with perfection in mind. At times we see minor discrepancies in our own faces such as bumps, deviated nose, enlarged chin, bony bulges etc. This is nature at work. Who said nature was perfect? When we look at ourselves in the mirror, we could also see different landmarks on our faces which we have never noticed before. Some of us have broad noses, some of us have enlarged eyebrows or even wide ears. 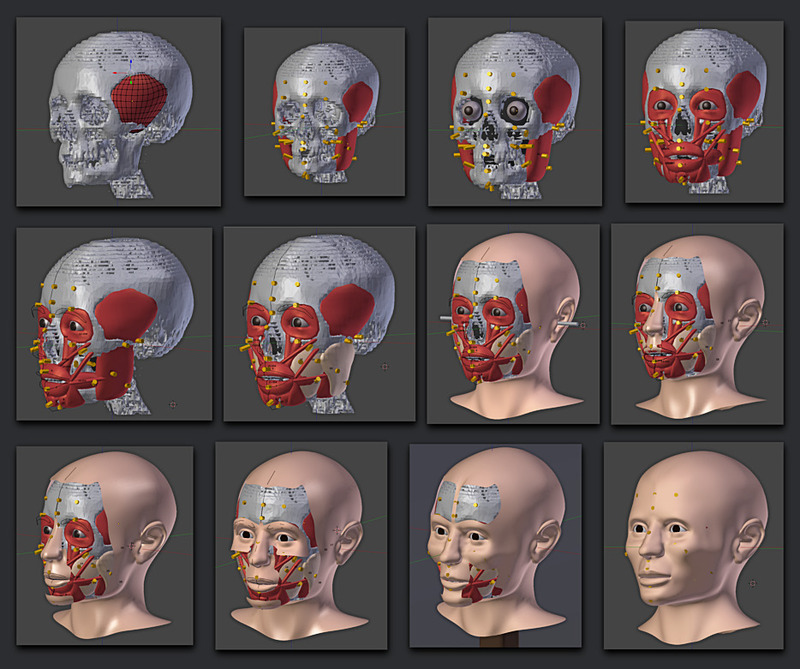 Now imagine each of these anatomical parts having different virtual points in them which may be used for measuring distances between points for the purpose of medical diagnosis, forensic examination, post-mortem reports, facial recognition, security in ports of entry and exit, mug shots, orthodontic points etc. These points do vary form person to person and is unique to each individual even though they may be seen differently or uniquely in exactly identical twins. There may be always some variations, even very minor ones. Science and identification have come a long way from its Humble beginnings. Right from whether it helps in identifying a person whether they are alive or when deceased these points do not change. The bony virtual points and lines hold their place and serve as permanent markers that help facilitate precise measurements that help in identifying an individual. With so many imaginary lines and points, we need to keep track of it and be careful not to mix it up. These days we are able to maintain an extensive network database of records using super computers that work for us behind the scenes round the clock. In today’s World, the technology has helped us in identifying each and every one of us who has been in the spotlight and in the public arena, meaning the streets and in public areas. So with technology computers can track us and find us anywhere using these lines and points. The lines and points may look simple to you and me but they mean a lot in terms of identification. They may also look innocent. Sometimes all of us would like some privacy. Technology is good and bad. It depends on the way how we view it. In terms of getting a positive ID in certain cases it is good but in others it is best to hold it in secrecy. In many cases most of us would agree that certain things in life are safe when it is left untouched and unseen. Our intricate details may be one of them. Our face do tell a lot about us even though our mouth is shut. Just like how we say that our eyes are the windows to the World, I would add more to that. Our face complements what we see through our eyes and reflects it back to the viewer with a smile on the face. So does our facial metrics. It’s just a matter of Lines and dots. All we have to do is to connect them and learn to love our face. The way nature has created them for a purpose. TO BE LOVED. Previous Post The Cost of SECURITY. Next Post Planting THE seed.